It's not easy "being green"? Really? Because I don't actually think it's that hard. I'm not one to shove recycling, composting, water conservation or other "tree hugging" tendencies down others throats. However, I was recently frusterated when I witnessed someone tossing a plastic bottle into a trash can sitting right next to a recycling bin. And yes, I took the bottle out of the garbage can and threw it into the appropriate bin sitting inches away (and then whipped out the hand sanitizer). So, I saved one bottle. That can't make that big of a difference, can it? I think so. One ton (2000 pounds) of recycled paper can save 17 trees, 380 gallons of oil, three cubic yards of landfill space, 4000 kilowatts of energy, and 7000 gallons of water. Known as the Great Pacific Garbage Patch and consisting of large concentrations of recyclable plastics, this mass of garbage is found in the north Pacific ocean and occupies an area more than twice the size of Texas. If each person were to reuse a paper shopping bag for just one trip to the store, we would save 60 000 trees. In America, the average daily water use per person is 150 gallons. In Japan, the average person uses approximately 100 gallons per day and in France a person uses 75 gallons. In the UK they use approximately 40 gallons per day and in Nigeria they only use 10 gallons per person per day. A modern glass bottle takes 4000 years or more to decompose, but glass is 100% recyclable and can go from the recycling bin to a store shelf in as little as 30 days! The list of impactful statistics is miles long. Thinking that one bottle, one newspaper, one leaky faucet or one individual does not have an impact is naive. If every one person thinking that way opened their eyes and changed their minds, the entire world would change DRAMATICALLY. Also, being green is not just a fad leftover from the 90's or a political commentary. It benefits our communities by providing jobs and supporting local businesses. It simply (I can provide some wine with this cheese if you would like) makes our local and global world a better place. So, what do I do to back up my words? 5. I turn off the faucet while I brush my teeth and wash only full loads of laundry. 6. I wrote this blog to remotivate myself and hopefully at least one other person. Though I do take many steps to reduce my footprint, reuse what I can and recycle many things, I know I can still do more. I use more water than I need to, I want to garden and compost and I am constantly feeling a pull to pursue recyclable art. I will work toward these things because I do believe that I can make a difference. So, please don't feel guilty or annoyed or judged by what I have just shared. Everyone lives in different circumstances with different resources and opportunities, but there is always at least one thing we can do to leave a smaller footprint. Be inspired. If nothing else, please just throw your plastic bottle into the recycling bin, especially when it is sitting right next to the trash. 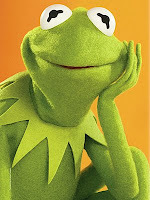 And go easy on Kermie. He's had a tough time being green.